American comic Phil Silvers, “King of Chutzpah” (b. Brooklyn, NY, May 11, 1911; d. Century City, CA, November 1, 1985), is instantly recognizable as Sergeant Ernest G. Bilko on The Phil Silvers Show (1955–1959). The television sitcom, set on a U.S. Army post, ran for 143 episodes, won nine Emmy Awards® (two for Silvers), and was so popular it was known familiarly as “Sergeant Bilko”; it was responsible for bumping Milton Berle off the air and is still to be found in reruns. Before its tremendous success, Silvers had won a Tony Award® for Top Banana (1951), his fourth Broadway appearance, and had chalked up some twenty-eight comedy shorts and feature films; after it, most of the roles he played were derivatives of Bilko. Fischl Silver was the youngest of eight children born to a Russian Jewish family. His father was a construction worker on New York’s early skyscrapers. At the age of eleven Phil Silvers had a paying job in a movie theatre as a reserve entertainer, in case the projector should break down as it often did. He left school at thirteen to sing in vaudeville and burlesque, and made three film shorts for Vitaphone before making his debut on Broadway in the ephemeral Yokel Boy (1939) – Silvers drew critical praise although the show did not. He then had a bright idea for a Broadway show, High Kickers (1941), that featured Sophie Tucker playing herself; Silvers did not appear in it but moved to Hollywood to make feature films. Hit Parade of 1941 was the first of a long list of movies for MGM, Columbia, and 20th Century Fox that included Lady Be Good (1941), You’re in the Army Now (1941), Coney Island (1943), Cover Girl (1944), and Summer Stock (1950). Silvers, with composer Jimmy Van Heusen, happened to be visiting the home of Frank Sinatra on the occasion of the birth of his daughter Nancy, and though Silvers was not normally a songwriter, he wrote lyrics to “Nancy With the Laughing Face,” which became a popular hit in 1944 and a Sinatra staple. Phil Silvers returned to Broadway in 1947 in High Button Shoes with Nanette Fabray, and scored his biggest New York triumph four years later with Top Banana, playing an egocentric comedian reminiscent of Milton Berle. Silvers won the 1952 Tony Award® for his performance, which he repeated in the 1954 3-D film version. Although The Phil Silvers Show (1955) was set on an Army base, it had next to nothing to do with the military except to roast it. The plot, created and written by Nat Hiken (also of Car 54, Where Are You?) focused on Bilko, a fast-talking petty swindler with a devoted platoon and endless ideas for schemes and scams, kept in check only by a bemused but wary Colonel. 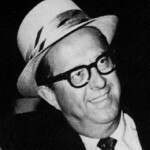 The series came to an end in 1959 due only to the high cost of its enormous ensemble cast; Silvers continued to play “Bilko” – or himself – in other venues under a variety of pseudonyms: Harry Grafton on the never-seen-again The New Phil Silvers Show (1963), Harold Hecuba on Gilligan’s Island (1966), Oliver Kasten on The Lucy Show (1966), Honest John on The Beverly Hillbillies (1970). His film characters, too, in It’s a Mad, Mad, Mad, Mad World (1963), A Funny Thing Happened on the Way to the Forum (1966), and the British “Carry On” film Follow That Camel (1967), were the same sort of slippery con-men. 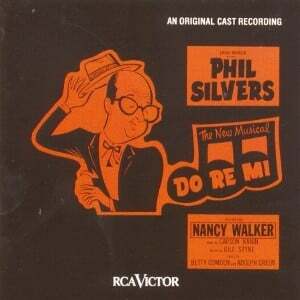 Silvers appeared again on Broadway in 1960 with Nancy Walker in Do Re Mi (earning a Tony® nomination) and in 1971 with Sandy Dennis in How the Other Half Loves. Inexplicably, Silvers had turned down the leading role of Pseudolus, the conniving slave, in the original 1962 production of A Funny Thing Happened on the Way to the Forum. In the 1966 film version, he portrayed a secondary character, but his chance came around again when producer Larry Blyden offered him the lead in the 1972 Broadway revival. This time, Silvers accepted; his performance won him his second Tony®. That same year Silvers suffered a stroke from which he would never fully recover. In spite of ill health, he continued to work in film (Won Ton Ton, the Dog Who Saved Hollywood 1976, Hey, Abbott! 1978, The Cheap Detective 1978, There Goes the Bride 1980) and television (Charlie’s Angels 1977, Fantasy Island 1978, Happy Days 1981). Silvers was married twice, first to the Miss America of 1942, Jo-Carroll Dennison, then to Evelyn Patrick, with whom he had five daughters. He was, as frequently were the characters he played, addicted to gambling. It is said that once, early in his career, as he was complaining about lack of money and work, he absent-mindedly pulled a big wad of bills out of his pocket. Why wasn’t he using that to buy lunch? He explained that it was just his gambling money. The end of Phil Silvers’s life was spent in a nursing home, habitually watching his old films and reruns; the ultimate cause of his death was a heart attack. He is memorialized by a star on the Hollywood Walk of Fame.